The New Year has started out with a bang and a reminder that for some IT organizations, old habits die hard. I tried to log in to my flexible spending account website to submit a receipt for the contact lenses I put off purchasing until 2018, only to be locked out. I wasn’t able to do an online password reset, so had to call customer service. There I was told that my password (which I just set back in December) was expired and that it has to be changed “every 90 days because of HIPAA.” I guess they missed the memo that HIPAA doesn’t require a specific password expiration interval, and also the one where NIST and other organizations are advising against forcing regular password expiration without reason. HIPAA remains one of the most incorrectly cited regulations I can think of and there’s not much hope for improvement. I also tangled with a pharmacy that insists on calling our office to request verbal authorization to change prescriptions from capsules to tablets and vice versa, even when our electronic signatures are placed squarely on the “substitution permitted” signature line as required by state regulations. This particular pharmacy is the only one who calls and I can’t imagine that their business is so slow that they don’t have anything else to do than to make unnecessary phone calls to physicians. I’ve always been a bit annoyed at the fact that most EHRs display a dizzying array of formulations that prescribers have to sort through. For many medications, it doesn’t matter if the dosage form is a tablet or capsule, but we have to select one or the other nevertheless. Of course it matters if it’s a liquid or a chewable when you have a patient who doesn’t swallow pills, but otherwise it’s just one more thing we have to assess when we’re clicking through the day. I had to play bad cop and threatened to report them to the State Board of Pharmacy if they continue harassing us. I’m looking forward to the day when I have robust clinical decision support in my EHR that takes the diagnosis I just loaded and the drug I’m selecting and only shows me the dosage forms and instructions that are pertinent for the clinical situation given the most current clinical recommendations and local antibiotic resistance. To do that in our current system, we manage order sets that each client has to build and maintain. I know there are more integrated solutions out there, but I don’t think they take the local resistance rates into account. At least not yet. For the vendor with whom I was on the phone the other day troubleshooting an issue with MIPS calculations, I’m going to recommend a New Year’s Resolution: if you’re going to bother being on a call, make sure you’re paying attention. This call was the culmination of efforts to manage multiple support tickets around several interrelated issues. At first I was impressed by their SWAT approach to getting the right teams on the call to try to solve the issue. My confidence flagged the first time that someone had to be asked a question twice due to “being on mute,” which we all know is a (somewhat illogical) euphemism for “not paying attention.” This happened again not five minutes later, with the second support rep at least admitting that he “was multitasking.” I would question the judgment in play when you multitask while you have a disgruntled client on the phone along with five or six of your peers who all have other (if not better) things to do. I used to work with a guy at Big Health System who would routinely be “on two conference calls at once.” I could never figure out why anyone would think that was a good idea. I had a bright spot in my week when I was orienting a new physician to our group. He wasn’t aware of Clinical Informatics as a subspecialty, but having been a computer science major, was very interested in hearing more about the path to board certification. He had been doing informatics work at his previous employer but didn’t see himself as much more than a super user. When we talked through some of his work, it was much broader than he thought. It’s always good to see the sparkle in someone’s eye when you discuss something they find exciting rather than thinking that conversations about EHR workflow are a chore. We’ll definitely include him in our clinical champion group and see how much he wants to participate now that he’s with us. I read with interest the reader comment from Sick Doc about urgent care centers being closed on holidays. Now that my practice is approaching 20 locations, we did some modifications of our holiday hours this year. Normally we are open 365 days of the year, but staffing every holiday in a practice that size was taking its toll on staff morale. We remained open, but not at every location, consolidating operations within a 10-mile radius of identified “core” locations. Signage and directions were placed at closed locations with matching website modifications. We piloted this approach with Thanksgiving and it was successful, so we continued it into the Christmas and New Year holidays. Overall patient volume was down but only slightly, and I think the decrease was within what you could reasonably attribute to people not wanting to miss out on family gatherings or to venture out into the bitterly cold weather we’ve been experiencing. We’re proud to offer care 16 hours a day, which is the most any urgent care in our area provides. Our staff definitely appreciated the greater odds of being able to spend time with family. They’re running pretty ragged with the spiking volumes due to influenza, which we’re countering by having lunch delivered for the staff every day, at least in the short term. Urgent care is definitely a growing market segment, with an announcement today that Mercy is partnering with GoHealth Urgent Care for Midwest operations. GoHealth already partners with health systems in New York, Portland, Hartford, and San Francisco. I hadn’t heard of them prior to the announcement, but got a kick out of their website’s picture of innovative facilities “engineered for your comfort and privacy” that appears to show a fishbowl-like exam room with glass walls along with a glassed-in vitals station where everyone in the waiting room can watch you step on the scale and get your blood drawn in the phlebotomy chair. The press release mentions that these are “smart glass” rooms, which I assume means they become opaque when people are in them. For a profitable urgent care, that should be most of the time, making the technology’s value somewhat questionable. The terrazzo floors look nice, though. Basic visits at the Bay Area clinic start at $250 (cash price paid in full at the time of service) and are $150 in Portland, $120 in Hartford, and $125 in the Big Apple. I wonder what Mercy’s existing urgent care physicians think about the announcement and whether their clinics will remain open? According to the release, charting will be transparent on wide screen monitors in each room using Mercy’s Epic EHR. GoHealth didn’t have great reviews on Glassdoor, so I’ll be watching this one closely. 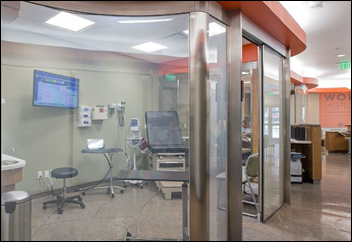 What do you think about smart glass exam rooms? Leave a comment or email me.